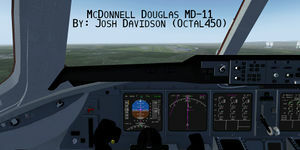 The IDG MD-11X is an accurate, and complex recreation of the McDonnell Douglas MD-11 by it0uchpods Design Group. At this time, it is still in development (Pre V1.0), and is not complete yet, but this will all be corrected! Good Virtual Cockpit, with AP panel, Overhead, and Pedestal. Good 3D Model, and liveries. Active development by the it0uchpods Design Group! See the right InfoBox for the Repository, or Download. 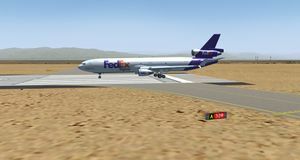 Remember to rename the aircraft's folder to "IDG-MD-11X". This page was last modified on 5 April 2019, at 23:49.